What do you do when your new boss asks to move the office into your apartment? I was struggling with the answer only two weeks into my internship placement in Chiclayo, Peru. Over the five months that followed, similarly unprecedented situations confirmed my suspicions: work culture in Peru is very different from that which I have experienced in Canada. Thanks to the synergy of Canadian and Peruvian organizations, I have had the opportunity to work with a consortium of NGOs dedicated to micro-enterprise development in Chiclayo, Peru. Each year, the Canadian International Development Agency (CIDA) offers young Canadian graduates the opportunity to gain international development experience by working with the overseas partners of Canadian NGOs, through its International Youth Internship Program. This year, I am one of three interns that the Canadian CED Network has placed with Peruvian partner COPEME (Consorcio de Organizaciones Privadas de Promoción al Desarrollo de la Micro y Pequeña Empresa) to support the micro-enterprise development initiatives of this organization. The program stands apart from most other international opportunities available to similarly qualified youth in that it is paid when you consider that all placements are in developing areas, so your living costs will be more than covered. Each year, positions are available in countries all around the world according to various development themes — including gender, environment, and health. 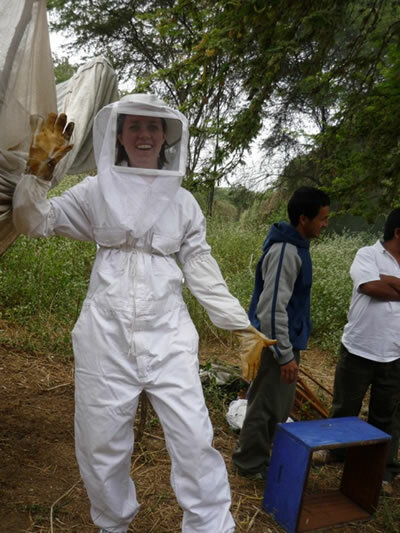 When I graduate last April from McGill University's History Program, I never imagined that I would soon be harvesting organic honey in rural Peru. But here I am, and harvesting honey is only the beginning. Through my internship, I have had the opportunity to interview mango farmers about their living conditions, assess youth entrepreneurial business proposals, attend policy discussions with community leaders, and meet all kinds of people who are innovating alternative strategies of community economic development (CED). The past few months have truly been filled with once-in-a-lifetime experiences. But it has not always been a smooth ride. While I have had to adjust to many aspects of Peruvian living, I have experienced the greatest culture shock in the work sphere. The line separating the private and work spheres in Latin America is not well-defined. In your internship, you may be caught off guard by the overlap, but be prepared to say "no" when you are not comfortable with something. Because previous bosses may have only requested tasks that are already expected of you according to your job description (e.g. “draft a letter,” “make a photocopy”), you are probably not used to saying "no" to your superiors. I know I was not prepared when asked to allow COPEME and its four staff members to move into my apartment and split the rent - by a boss who I had recently met and was still very eager to impress. It can be difficult to find a way to decline. In most cases, it is best to keep a sense of humor about the situation, rather than take private/work overlap too seriously. Some behavior that may be considered unacceptable in your home country is run-of-the-mill here. Do not take it personally. For example, my office organized a "Welcome Workshop" for me, where we played team-building games and got to know each other better. Activities included sharing our happiest and most painful life memories and a game where we had to choose who among us had the prettiest eyes, hair, smile, etc. Try to keep in mind the goal of such activities (in this case, team-building), rather than take offense to them. Ultimately, you are responsible for drawing the line defining your comfort zone and deciding how much you wish to invite the office into your personal life. Do not worry too much about offending your superiors, but be diplomatic in your objection. Most likely, whatever the office loses on account of your line-drawing will be much smaller than the benefit you will gain from it. If you hope to maintain your sanity, you will draw your own invisible line wherever your comfort zone may be between your personal and work lives. The Peruvian workplace is vertically organized. The “Boss” receives or designs projects, which his staff help him complete. Often, rather than a division of labor (a communications specialists, a bookkeeper, etc. ), everyone helps out in every area until the project is completed. In your internship, do not expect to have the independence that you might have working for a Western NGO. Instead of having your own assignments, you may be most useful to your host organization by helping them out with minor tasks. Sometimes, that means doing little or nothing. Keep an open mind about the cooperative team mentality that exists here; do not hold onto the idea that your way is more efficient and therefore better. Just enjoy the afternoons you get off once in a while as a result. Most of the things you learn during your internship experience will happen outside the office anyway. And while it may sometimes feel like tagging along, remember that your presence alone, as a foreigner, can be valuable to them. You may find yourself to be the guest of honor at a number of events, even though you are just an intern. But as a foreigner, in Peru you represent an important partnership with the international community. Although there are many women rising up the ranks in many business and organizations, there is still strong support for traditionally defined gender roles. In the office, women tend to receive menial tasks and heavier workloads. Finding a position within your organization that is both beneficial to them and satisfies your learning needs and expectations can be difficult. Though all of the CIDA internships are posted with fairly detailed job descriptions, your daily tasks will depend very much on the needs of your host organization and may turn out to be very different from what you expected. If you are having trouble in your position, use language that demonstrates to the organization why making a change your work situation would be of direct benefit to the organization. Language use is important. While it may be standard in your home country to express grievance in a way that demonstrates why you are personally unsatisfied, such language is not as respected in Peru. Beginning sentences with "I feel that...," translates to mean that the problem is yours and not anyone else's — and may discredit your argument completely if you are a woman. Do not be discouraged. If you are having trouble defining your role, I would recommend first and foremost continuing to present alternative proposals for projects that you can work on. At the same time, always try to recognize the value of the work you are already doing; even if it seems insignificant to you, it could be very useful to your organization. Welcome to your new office in Peru! Here is your desk and here is the giant picture of Jesus that will look down at you during your stay. Peru is a very Christian country, although in the cities there are many people do not regularly go to Church and do not consider themselves religious. That said, you will still encounter many Christian representations in the urban workplace, whether you work for a Christian organization or not. Around for Christmas? Get ready for a giant nativity scene set up — and a glass of wine and cake on Jan 6, when it is taken down. This has been the most wonderful culture shock to me. Have a meeting at 9 a.m.? Don't expect everyone to come until at least 10 a.m. Do not get stressed out about this - no one else is. Instead, embrace it. Have a ton of things to do in your personal life (pay bills, etc)? It is perfectly acceptable to leave the office to get them done, so long as there is not an imminent deadline. This has to do with the aforementioned overlap of personal and work spheres. The 9-to-5 mentality does not exist; what is important is that projects get completed - that means sometimes you will work extra-long hours, but other days you will have the afternoon off to go to the beach. Keeping an open mind is the most important advice along with keeping a sense a humor, and applies to all of the above situations in which you might experience culture shock. You are not working in your home country, so do not constantly compare the two — just embrace your new work culture. Even if it is frustrating now... at least it will make for some good stories when you get home. And you will be a stronger person for surviving the challenge. Country Insight (Country facts and cultural information on the countries of the world). Living in Peru (online publication for ex-pats in Peru). Travel Report: Peru (information on safety and security, local laws and customs, entry requirements, health conditions, etc. Published by Foreign Affairs and International Trade Canada). Amy Smart is a recent graduate of McGill University, where she studied History, International Development, and Environment. She is very interested in the development field and has worked with NGOs in the themes of health, free expression, and community economic development. She is currently in Chiclayo, Peru, where she continues to work as an intern for COPEME. She plans to return to school next year to study Journalism.